The stormy calm before the storm. The week has been a busy one for the volunteers on skomer, tasks have included fixing hides, digging out compost toilets, painting, sorting out accommodation, taking materials to Skokholm, fixing signs and even a little bit of monitoring. With a strong n wind for the better half of last week birdwatching has been tricky, but highlights have been Sarah's ring ouzel and some Godwits yesterday spotted by vol Geoff. 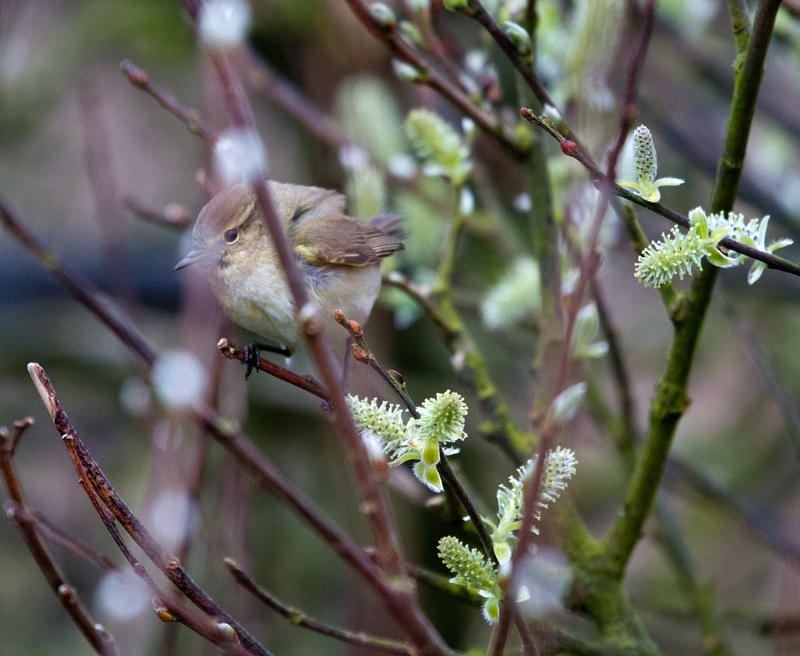 Steady trickle of chiffchaff and willow warbler. 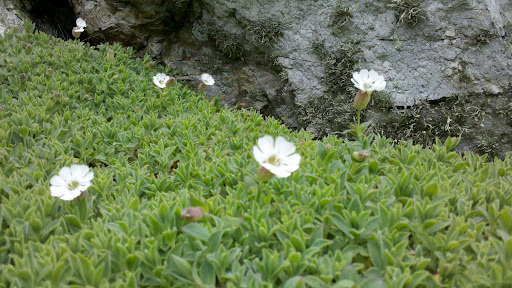 Sea Campion has started to flower but only ok the sheltered aspects which are spit facing. 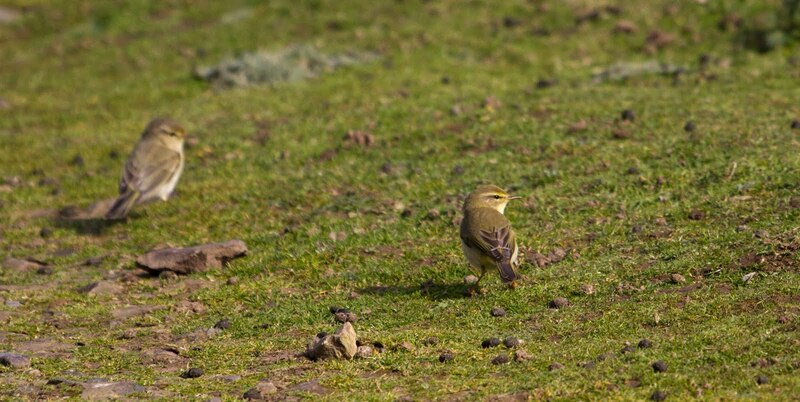 Lots of movements of researchers and volunteers over the next few days as the island population starts to expand. One researcher came on to look for Owl Pellets to assess winter diet. First Crane-fly of the season. 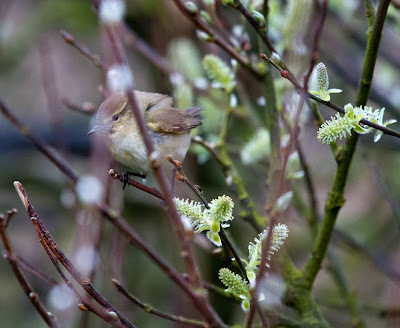 Singing chiffchaff, among several others. Linnet - first for year. A strong and cold Northerly breeze means there are no seabirds on the cliffs today (give it a few weeks and you will not be able to get them off the cliffs). Not much in North Valley...in the more sheltered South Valley there were a couple of Chiffchaffs and three Goldcrest - always a delight to watch flicking around the bushes with their high-pitched call. Peregrine in the garden this morning. The nights are darker (late rising moon and not a full moon) which means there are more Manxies being heard and seen on land - still no cacophony, that really kicks off in April as the Male birds are defending prized burrows. 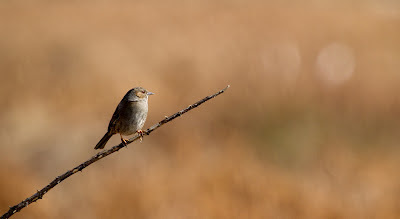 Dunnock - North Valley, Chris Taylor. 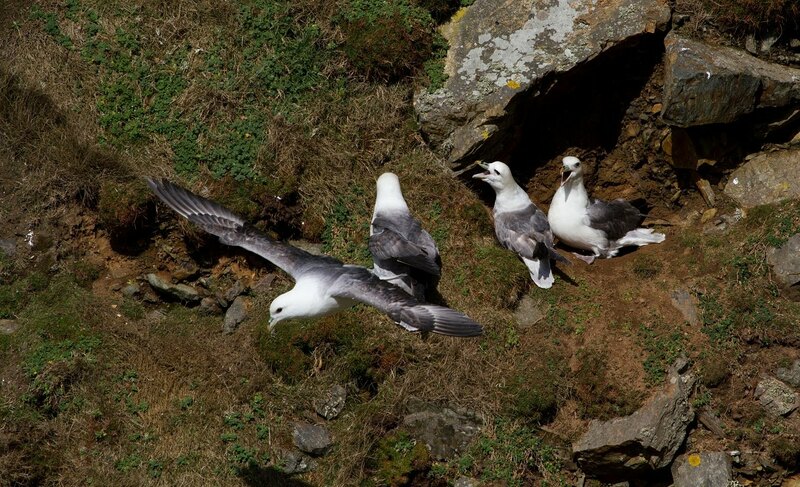 Fulmar are having quite a few squabbles over nest sites. 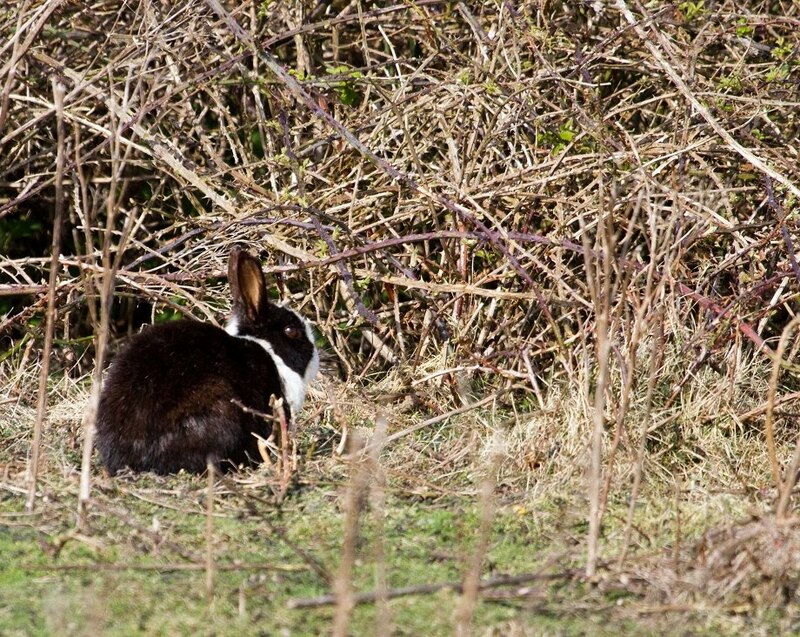 Spotted these little chaps this morning while out and about. 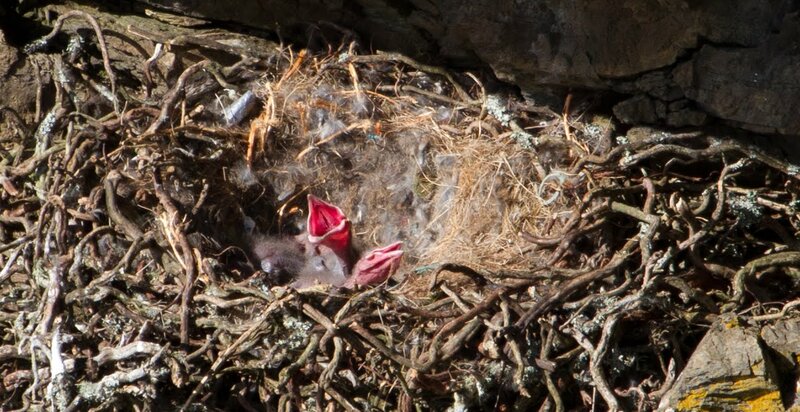 This is one of the earliest recorded Raven chicks on Skomer. 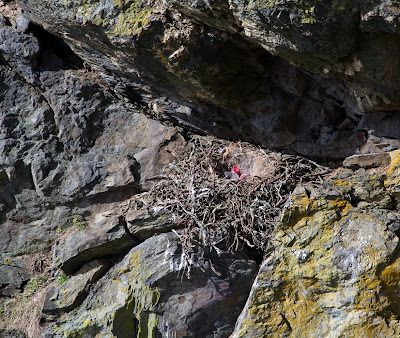 Incubation is usually 22 days (according to BTO) so these eggs were laid before we even got back to the island. 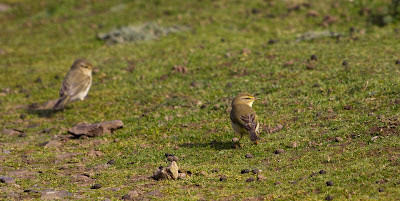 This is not out of normal range (mean lay date 20 Feb - 6 April- BTO) but definitely towards the earlier. I left pretty quickly so that the parents could get on with feeding their hungry young......there are definitely two chicks, I think there are more....we shall see. All pictures by Chris Taylor - Skomer Warden. Different calls - not going to describe them though. Some highlights from the last few days - managed to get ahead of tasks so had more time to get out today! First Puffins out to sea. After a weekend of settling in and enjoying being back on Skomer it was back to work with a Monday meeting. A chance to find out what's happening in the next few weeks and sort out our list of tasks to be completed before and after other people return. As if cleaning our own rooms wasn't enough we ploughed straight on with the volunteer quarters. It seems that each year at least one room gets exposed to the elements while we're away, this winter it was the volunteer kitchen. A window had blown open and there was evidence that an owl had used the place as a short-term roost. With the full arsenal of the cleaning cupboard Sarah and I set about disinfecting, scrubbing, washing and wiping every available surface. The place is now spotless, apart from the muddy footprints I left when walking across the freshly-mopped floor in order to borrow a potato masher. Sarah and Jerry stop for a cup of tea, hoping that if they leave the cleaning products by the fridge and oven for long enough they will magically cleanse themselves. Meanwhile, Chris took on the infrastructure; checking the electric and plumbing systems are working. As I'm able to use the internet and have a hot shower (not together) I'm pretty happy with them. Chris wondering where the one unlabelled pipe brings water to and from. We've also been on with checking the boat and engines, assessing winter damage to the landing, moving fridges about, redesigning leaflets and mostly making lists of more jobs that need to be done. Can't wait to go through the whole process again over on Skokholm. The bird life is still pretty quiet, but the first Chiffchaff is down North Valley, while Snipe and Wigeon have been about. Guillemots and Razorbills have been on the cliffs today. Ravens are on their nests on the Mew Stone and Amy's Reach. Plenty of Buzzards and a flock of 21 Chough. Sarah's been out looking for Iceland and Glaucous Gulls near Pigstone but no luck so far. Around mid day yesterday Chris, Sarah and I assembled in Martin's Haven for the start of the 2012 season on Skomer and Skokholm. With a massive amount of help from Nathan, who works on many of the Trust's mainland reserves, and Mark, of the Marine Reserve team, we were able to launch our little boat and get it loaded up with our kit for the next nine months and food for at least the next two. Loading up - not that much baggage considering. The sea was calm but the boat engine felt like it needed a bit more running to be totally reliable, so we were glad of the offer from Peter on the Lady Helen to accompany us on the crossing. We became extremely grateful of this offer as we headed out across the sound as we lost sight of the mainland in the fog before we could make out Middleholm. With this limited vision we kept our guide boat in view while passing the odd Fulmar, Gannet, Shag and Razorbill until out of the cloud emerged the entrance to North Haven. Wondering where we are in the middle of Jack sound. "I think this is the right place"
Stage one accomplished. With us and our gear on the beach, Sarah and I went to moor the boat while Chris headed up to fetch the tractor and, true to form, didn't reappear. As we'd had reports that the buildings were undamaged our worries were focussed on the tractor. In between fiddling with the connections, charging the battery and drinking tea we had a quick look around. The buildings look in good nick, Chris's kitchen was in need of a good clean but that was true of the entire of last year. 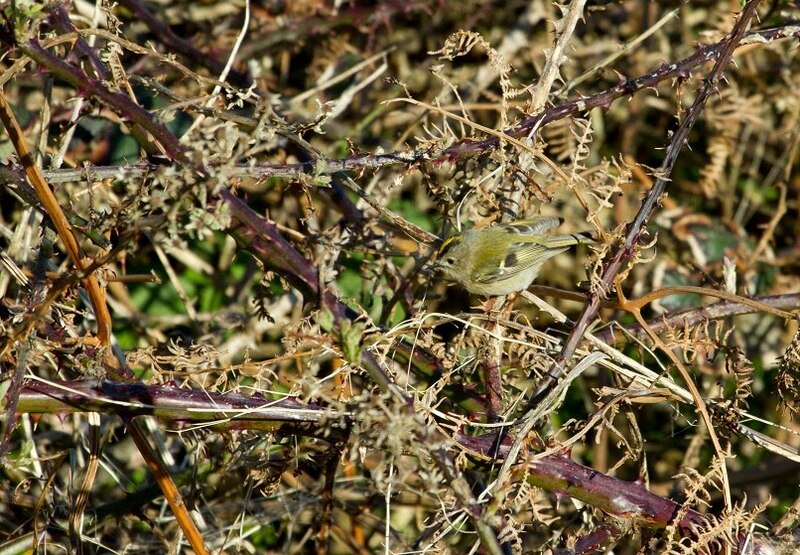 Fulmars are paired up on the cliffs while a couple of Goldcrests joined Robins and Blackbirds in the ivy. The dozen seals that had watched us unloading were joined by another 70 on the main beach. Praying to the tractor in the hope it works. Knowing if we left things too long we'd be shifting gear against the tide and darkness we reluctantly started carrying bags up to the farm. It's a long way when you're loaded with gear and know you've another few trips. A quick check around showed the buildings and infrastructure again looked in pretty good nick, so we grabbed a couple of wheelbarrows and headed back down to the beach. I suggested Chris may as well go and give the tractor another try and, as always, just when we'd given up hope, it worked! So we were able to get kit up quickly which gave us enough time to do a basic clean of the kitchen and bedrooms (enough to eat and sleep comfortably) and have a quick look around, watching a Hen Harrier hunting in North Valley. Today we're getting settled. So that means more cleaning, unpacking and sorting, throwing out bits that haven't survived the winter, a few repairs and mainly having a chance to get out around, enjoying being back on Skomer. It's cold and windy but the first daffodils are out, there's been a couple of large bees fly by and there's frog spawn in some of the streams. 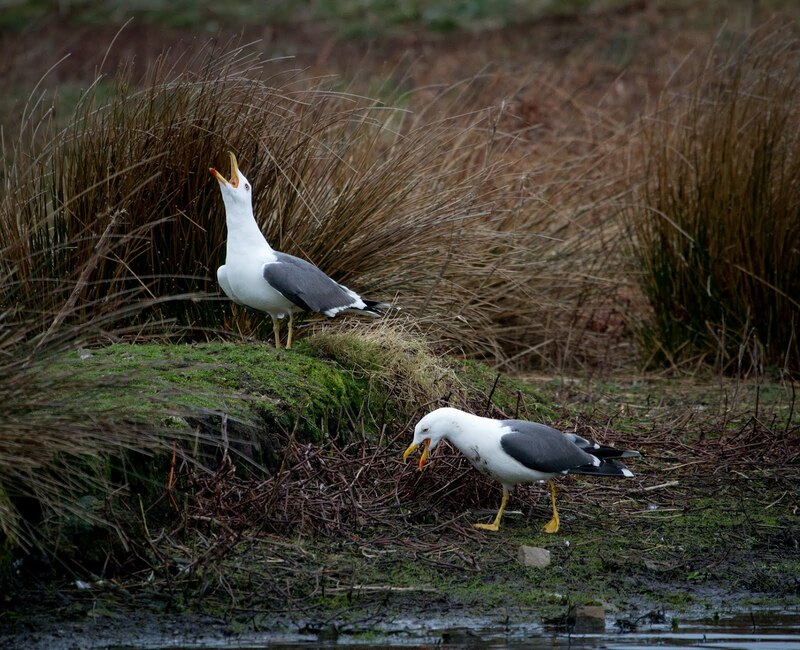 The gulls are back in large numbers and don't seem particularly pleased to see our return. There's a good number of Buzzards about, a Merlin, and a Peregrine hunting really close to the farm this morning. Evidence that a Barn Owl has been using the picnic shelter over winter.